Last time, we looked at the Audio Technical M2 and M3, as well as the Sennheiser G3 300 IEMs. 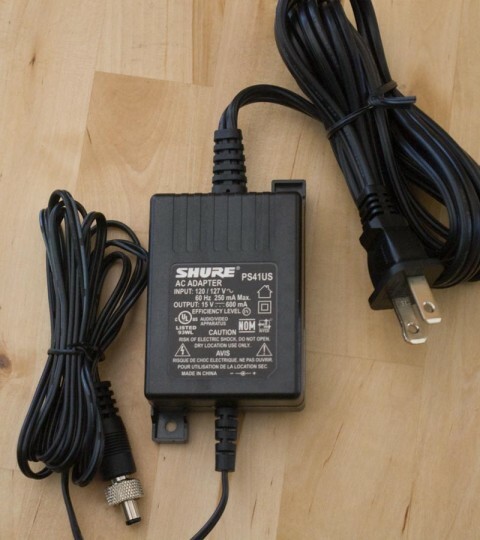 This time around, we'll tackle the Sennheiser 2000 series and the Shure PSM9. When we fired it up, the first thing we noticed was an extremely high noise floor. Without any signal, there was significant white noise at any volume setting. Even with signal, it was still present and annoying. Kevin Sanchez, who has several units, said this is not normal, but I couldn't find a solution even in my testing afterward. The display is nice.The 2000 series are all full-rack width, and come in single and dual transmitter models. The dual, shown here, is completely redundant. Built like a tank, it's clear this model was designed to survive the rigors of the road. It's really two complete transmitters, with full controls and connectivity in a single box. Everything is done through a menu, which is a little slower than a few dedicated controls, but it's pretty intuitive and easy to get around. 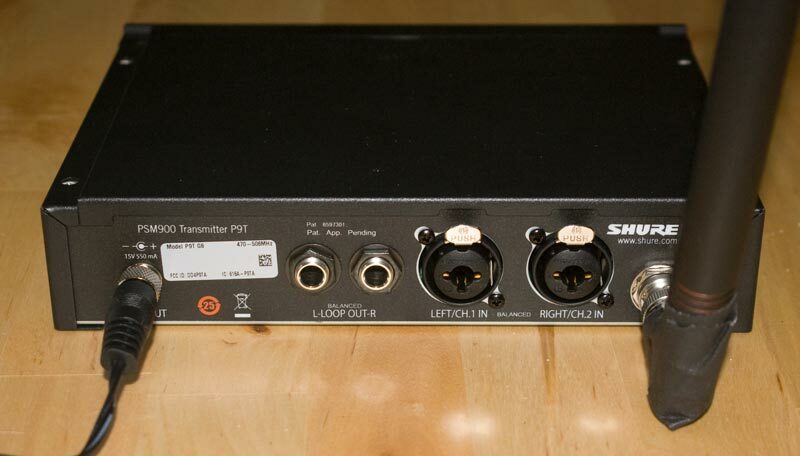 The audio meters show very fine resolution, and make it easy to set the right input gain. Like the G3, the entire display turns red and reads "PEAK" if you overload the front end, a nice touch. Also like the G3, the 2000 series is networkable. The other side is exactly the same.Keeping up the trend, the 2000 has combo XLR / 1/4" input jacks, and balanced loop outs. The BNC antenna connections make it easy to use combiners or external paddles. This is the only unit that is powered by a standard IEC power cord (and the power supply is the only thing shared by the two transmitters). Each transmitter (in a dual model) has it's own Ethernet jack, which could be good, or a pain, depending on your point of view. Look familiar? It's just like the G3.The bodypack is pretty much the same as the G3, at least outwardly. The menu system is exactly the same, as is the very useful and informative display. Like the G3, the pack feels sturdy and solid; certainly road-ready. The sound quality of the 2000 was excellent, aside from the annoying hiss. Range was significantly less than the G3, on par with the ATs. Audio quality was higher than almost any other in this shootout, with excellent stereo imaging; clear, crisp highs and solid lows. It could play very loud and still sound good, if it weren't for that blasted hiss. For me, as well as others in attendance at the CTDRT, the noise floor was a deal breaker. I'll admit to being a little biased about these. I heard them at InfoComm a few weeks ago, and was blown away. On second thought, maybe I'm not that biased. I've complained long and loud about the poor performance of the PSM600 and PSM700, and said on many occasions that Shure had ceded the wireless IEM market to Sennheiser and others a long time ago. The introduction of the 900 changes everything, however. I like the dedicated input level controls and the informative display.A little background on this unit (since I know it). From an audio and RF standpoint, they pulled out all the stops. They used the same Audio Reference companding as in the UHF-R series wireless mics. They also played some cool tricks with the RF; it's almost impossible to overload the receiver (even touching the antennas together), and when the RF signal drops off, it simply mutes the audio, none of that crazy ppphhhhzzzzztttt sounds that we're used to. With performance that high, you would expect to find other features such as dual-unit full rack width models and networking. And you'd be disappointed. The 900 is designed to compete directly with the G3, though performance is on par (or even surpasses) the 2000 series. To make that price point, extra features were eliminated. Thankfully, they kept the good stuff. 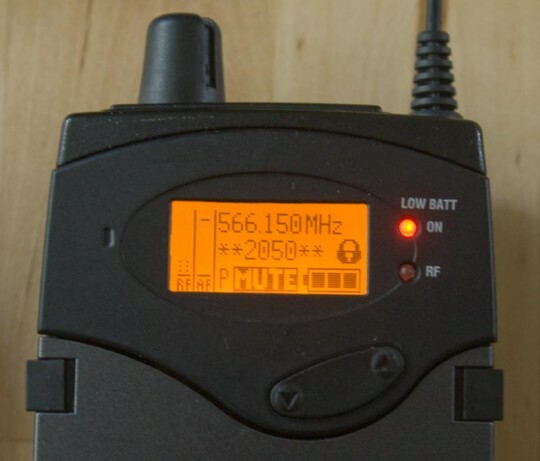 I would liken the transmitter to the ULX series of wireless mics; it's not quite as solid as the UHF-R, but if you took care of them, you'd be OK on a tour. In an install, I wouldn't worry at all. Looking at the front panel, you'll see dedicated input level controls, which I really like. The Enter/Exit/Menu controls will be familiar to anyone who's used a UHF-R sereis mic, as will the sync section. It's easy to use the receiver to scan for a clear frequency, then sync the transmitter appropriately (and the sync was crazy-fast, much faster than a UHF-R). There is also a headphone jack (1/8") with volume knob and an interesting switch that allows you to turn the RF section off, killing the output of the transmitter without powering down. I'm not sure I can come up with a need for this, but surely someone has thought of one. Same as the others.Out back, we find the usual suspects; combo input jacks, balanced 1/4" loop outs, a BNC antenna input and a power input. Note the antenna on this one had a very loose hinge; we needed to shore it up with gaff to keep it upright. However, notice that it is a loaded 1/2 wave version, something that contributed significantly to it's exceptional range (below). At least it doesn't take up more than one plug...Power is supplied either by the inline wart or an active antenna distro. I'd rather have an IEC cord, but I'm sure they remote-mounted the power supply to save space, and this is better than a plug-mounted wart. The receiver is built like a tank.The P9R receiver feels very solid in the hands, and will surely survive several falls to the floor. 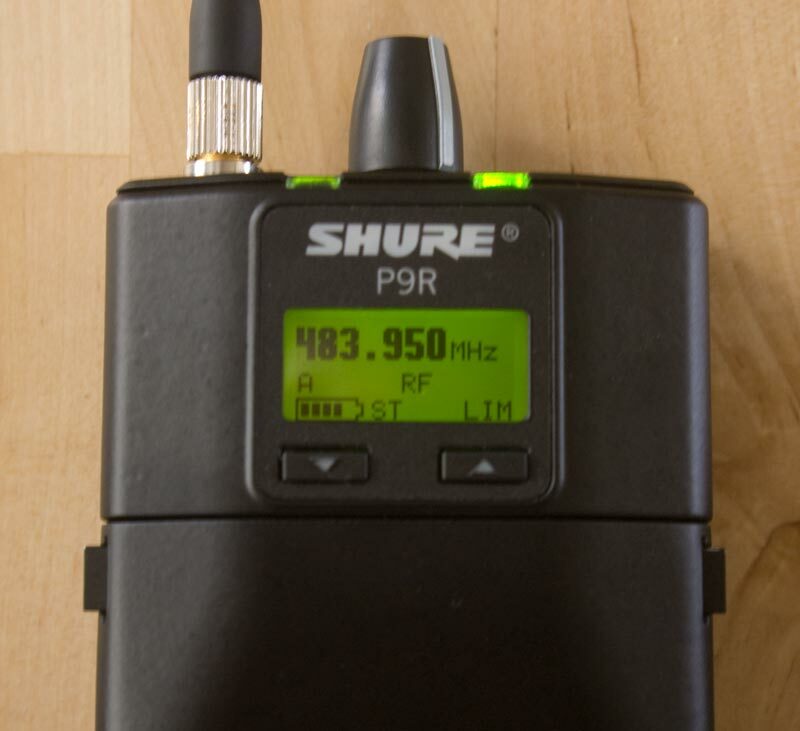 You get audio and RF level metering, battery status, and limiting indications as well as frequency. The limiter is really a maximum volume control; set it to 4 and you can turn the volume knob past 4, but it won't get any louder. This is a good feature to help prevent TTS (Temporary Threshold Shift), a phenomenon that happens when you play for a while and you have to keep turning it up to feel like it's the same level as it was before. 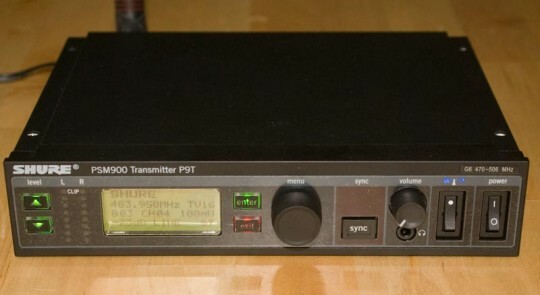 Another feature (shared by the 2000 series, I should point out) is the ability to sync one receiver with multiple transmitters. If you're a monitor engineer, you don't need to strap a pack on for every artist you're mixing for; just sync your receiver with all the transmitters and you can jump between their signals very quickly. It's clear both the 900 and the Sennheiser 2000 were built for touring situations. As for the sound quality, it's simply amazing. If I closed my eyes and someone switched between a wired signal and the 900, it would be hard to tell the difference. It has every bit as much clarity and stereo separation as the 2000 series (albiet with a tad less low end), without the annoying noise floor. The range of the unit simply blew everything else away. I walked out my front door, and headed down the street. I hit the dead end a good 800 feet from my dining room and still had signal; it was just starting to break up. Interestingly, that was at 50 mW transmit power--I switched to 100 and it didn't make a lot of difference. I should note that the PSM900 is switchable between 10, 50 and 100 mW of transmit power. Online pricing puts the PSM900 at around $1100. I've gotten better pricing by shopping around a bit. So for less than half the cost of a 2000 series, you have all the sound quality, none of the noise and range that isn't even in the same league. About the only thing you give up is dual transmitter models and networking. Since I'll be installing this permanently, I can live without the networking. The range and sound quality is so much better than the competition in it's price range, there's really no contest. Friday, I'll post some audio samples recorded from the headphone jacks of the receivers.